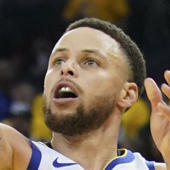 OAKLAND, Calif. --Klay Thompson's desperation 3-point attempt flew well wide of the mark, cementing the Los Angeles Clippers' improbable 135-131 Game 2 victory over the Golden State Warriors -- during which the team overcame a historic 31-point deficit. Elated, the Clippers bench stormed the Oracle Arena floor with the swagger and confidence they've brandished not just for the first two games of this series, but for the entire season. Trailing by 23 at halftime, Clippers coach Doc Rivers told his team they were going to win the game -- he couldn't tell them how, but he knew they were going to win. And it wasn't through some miraculous change of perspective or brilliant strategical adjustment. They were going to change the game by staying the same. "It's who we are," Rivers said after the game. "We talked about that. Every timeout, it's just who we are. Be us. We said it, 'let's be us. Don't change. Keep playing the way we play.' They hung in there long enough. We found a way to win the game." Rivers tinkered with the rotations until he found a group that worked, led by Lou Williams, who was the best player on the court in a game that featured two MVPs and four All-Stars -- all on the Warriors. Williams was simply magical, scoring 29 of his 36 points and dishing out seven of his 11 assists in the second half to power the Clippers' miraculous comeback. Montrezl Harrell was on the receiving end of many of Williams' perfect passes, scoring 17 of his 25 points in the second half. As for the Warriors, who have rarely been on the wrong side of history over the past five seasons, they coughed up the biggest lead in NBA playoff history. Why? Golden State coach Steve Kerr kept it simple after the game, saying the Warriors just "stopped playing" in the third quarter. "When I say 'we stopped playing,' we stopped playing defense, offense, execution-wise," Kerr added. "We were not as engaged as we needed to be. We got exactly what we deserved. The Clippers were great. They executed. They were hungry. They stayed connected. They were together." Against some other teams, the talent alone would have stopped the Warriors from a complete collapse. The game would get close, Stephen Curry or Thompson would hit a couple of 3-pointers, and it would go down as a close call that the team would have to learn from. But not against these Clippers. These Clippers are used to defying the odds, putting in the work to do so on a nightly, quarterly, minutely basis. They should believe in themselves, even when they get down big. This is the same team that launched a 28-point comeback to beat the Boston Celtics earlier this season, among other big turnarounds. If you think about it, their whole season is a series of comebacks. The Clippers came into the year having traded their franchise player, Blake Griffin, last season and having let another one -- DeAndre Jordan -- walk in free agency. Then, just as they were defying odds and making a playoff push, they once again dealt their best player, sending Tobias Harris to Philly in exchange for a group of players nobody knew would fit together. To say they were counted out would be an understatement. So when they do fall behind, there's no shift of attitude or rah-rah speeches. The message is simple: Just do what we do and play Clipper basketball. The rest will take care of itself. "I've always said to guys, just play as hard as you can, live with the results," Williams said. "We have those big deficits like that, I don't really think we can come back and win the game. We just play as hard as we can to give ourselves an opportunity not to get embarrassed. When it gets to a place like, 'this is OK, doable,' that's when your mindset kind of clicks." The Clippers might not come back to win this series. They might not even win another game. But the culture they've established is something that lasts. It's a culture that helps get the most out of its players and one that could attract key free agents to Los Angeles to be a part of it this summer. "We definitely knew what type of team we had coming into it," Harrell said after the game. "We definitely knew what type of identity we wanted to make on our team. That's what we did. Even when the trades went on, we welcomed those guys in with open arms, got them on the page with what we wanted to do as a team. ... It's a lot of the outside world coming up with those comments, stuff like that. We don't really care."